Velma Jean Miller, 84, Topeka, Kansas passed away Tuesday, February 5, 2019 at her home. Velma was born March 11, 1934 in Holton, Kansas, the daughter of Edwin Homer and Helen Marie (Gerard Boyles) Hochuli. 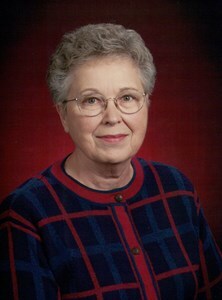 She was a 1952 graduate of Holton High School and attended Kansas State University. She was employed by Pomeroy and Pomeroy Attorneys at Law and later for American Express Financial Services in Topeka until retiring. She was an active member and volunteer of Susanna Wesley United Methodist Church. Velma married Jack W. Miller on June 5, 1955 in Holton. He preceded her in death on April 14, 2005. Survivors include two children, Mark Miller and wife, Lois, Topeka and Susan Marcus and husband, Jeff, Aurora, CO; three grandchildren, Amanda (Jon) Scully, Meghan Munsee, Stephen Marcus; and five great-grandchildren, Kiley, Kayla, Sanora, Jack and Cain. She was also preceded in death by her parents; her step-mother, Thelma Hochuli; her step-sister, Marilyn Myers; and her brother, Sheldon Hochuli. Velma was a wonderful and loving wife, mother, grandmother, great-grandmother and friend. She loved spending time with her family and friends, especially her grandchildren and great-grandchildren. She enjoyed reading, decorating and musical events. A funeral ceremony will be held at 1:00 p.m., Monday, February 11, 2019 at the Dove Cremations and Funerals, Southwest Chapel, 3700 SW Wanamaker Rd, Topeka. The family will receive friends an hour prior to the service. Interment will follow at Holton Cemetery, Holton, Kansas. Memorial contributions may be made to Susanna Wesley United Methodist Church, 7433 SW 29th St, Topeka, KS 66614. To leave a special message for Velma’s family, please click the Share Memories button above. Add your memories to the guest book of Velma Miller. Was sorry to read of your mother's passing in the Topeka Newspaper. Don't know if you remember me but Carol & I were your neighbors on 37th back in the 60's & 70"s. We have a lot of fond memories of your parents and will cherish them forever. Your dad did a lot for us and we appreciated it immensely. Our deepest sympathy to both of you and your families. We were sadden to hear of Aunt Velma's passing. We only saw Velma and Jack at family gatherings, but She and Jack made us feel like we lived next door. She will be truly missed. Our thoughts and prayers are out to Susan and Mark. May God Bless. Velma was a Sweet and Enjoyable Lady. She will be missd by all her friends and relatives. Now she rejoins Jack and I know they will be together forever. RIP Aunt Velma! I worked with Velma at IDS Financial Services in Topeka. She was a wonderful person and will be missed. Now, Velma is Home and in peace. She will be missed by any that were touched by her friendship. She was always smiling and I will always remember what great neighbors she and Jack were.